What about trickster gods, what they can teach us? I had some experiences with Loki and he seemed to be willing to interact with me, I asked him simple things while doing devotional work for some months and it seems he answered my requests, I had a bad result one time, though, when I almost fought with a person I was involved with in a magical group when he told me about his suspicions of magical attacks supposedly done by me (silly, I know, but looks like the guy was/is a little paranoid). On the other hand, when asked Loki to give me a good experience in one night, I had the most vivid and lucid dream in my experience, it was great. I also noticed something very fiery about Loki, nothing to do with tricks and things like that, but an energy, sometimes even explosive, that reflects a kind of passion for existence. Trickster gods in whatever part of the world represents opportunity, choice and movement. They are considered as a chaotic element, a disturbance, which we know as Chance or Luck, one of the epitaphs of Fortuna. Trickster gods are experienced as disturbances as they entered a temporary order and literally shake it up, hence pointing towards the fragility of any condition – of creation itself – and in this realization they inspire us to search our Luck, our good fortune; our destiny. In the case of Loki we find a great example of the path of devastation and turbulence that leads to Luck and this is demonstrated in one of Loki’s runes perth. This rune has been subject to several interpretations and is perhaps more known as a rune of Frigg – which it is indeed – but it is a Loki rune more than anything. Scandinavian transmissions teach that perth replicates the roar of the wolf, hence it is seen as the jaws of the wolf as replicated in the cup that holds the dices in games of Luck. So, it is one of Loki’s children, Fenrir, he who swallows the Sun, which is also the power that holds Luck. With trickster gods we are invited to life and the charge is as Henry Miller said: “Every man has his own destiny: The only imperative is to follow it, to accept it, no matter where it leads him.” I think it is in this the trickster gods gain a bad reputation, the temper and tease, they challenge and seduce. We might not know to where, but it will always be to the right place if we decide to let go of resistance and embrace the journey. So we can see here the force of order rising from chaos, Odin, rejecting the need for the force of transformation, his brother of blood, Loki. In this Odin demonstrate the docile temperament that infests us when life is good, but not harmonious. The illusion must be brought into question and in doing this what is good will stand stronger. In ‘Lokesenna’ Loki is challenging each and every aesir with their flaws and imperfections, questioning their character as it were. He was the always needed hasatán, the Devil’s Advocate. 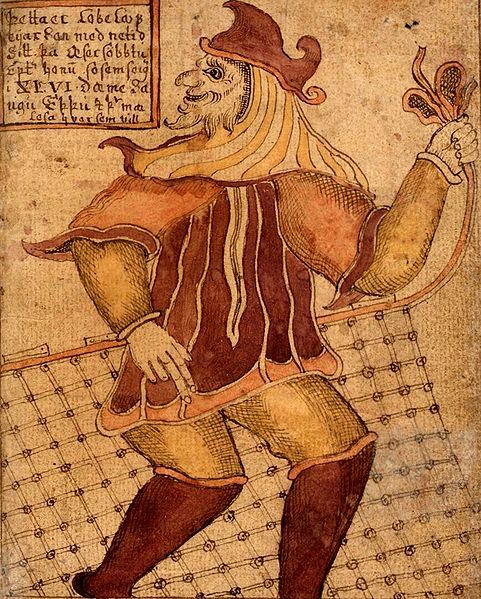 Loki, as a force of movement, transformation and trickery is also found in his heritage, where his father is Fårbautne (he who strikes hard) while the mother is subject for dispute. He however married a jotun woman, Sigyn - but it was with his mistress Angerboda he fathered Jormundgandr, Fenrir and Hel. In Voluspå, the poem that speaks of ragnarøk and the end of the world Loki and his children actively seek to destroy the aesirs just to provide the coming of Balder. In doing this Loki is the master of all the forces of cosmic renewal, it be by war, famine, or shaking our illusions. Loki is also a shape shifter and is associated with fire and also air, he can transform in shapes as much as elements and in doing this he invites unpredictability. In holding all these features we ascribe to ‘trickster gods’ we can see some sense emerging, Loki is the force of transformation that announces constant change. He is the lucky charm in the crossroad of the worlds. And speaking of crossroads, which are junctures of decision and choice, this is what he is. We are the consequence of the choices we make. And this is important; the trickster gods will always get this point across, that YOU are the owner of your choices. If you err in choosing this is also your fault, because you simply made a bad election at the banquette of gifts, requests and challenges. So, a trickster god is always a force that challenges you to be true to your self – and to be true to yourself means to always be in a state of acceptance - because in this way our joy of being will be in a constantly shifting world. Failure to confront this challenge in the right spirit will always be resistance, anger and finally devastation. Life is a dance and a journey and opportunity is the stardust swirling up as we dance through life, if we take the opportunity or not depends on how well we know our Self – and this is the first teaching of the trickster gods!